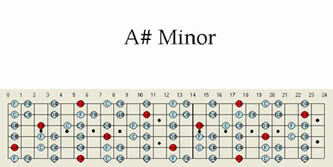 A sharp minor Guitar Maps are a unique way to learn and practice A# sharp minor guitar scales. GuitarMaps and using guitar backing tracks are a simple way to develop a better vision of the whole guitar fret board, allowing you to play solos anywhere on the guitar neck. Guitar Maps connect A# minor guitar scales together so you can follow them up and down the fret board.